A renowned tile adhesive from market leader BAL is now better than ever – in a container from RPC Containers Oakham. BAL remains the only brand of choice for thousands of professional tilers, with a reputation built through a half-century of innovation. Market leader since 1963, it has created some of the UK’s most popular adhesives, including the trusted White Star. 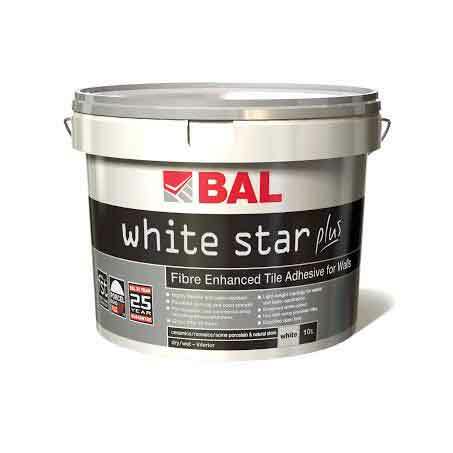 Now, following intensive research and development in conjunction with fixers and contractors across the UK, BAL has replaced its much-loved product with White Star Plus, incorporating new Fibre Strand Technology (FST). One thing that hasn’t changed is the robust, quality pack – an 11.3L PP 293SL standard container from RPC Oakham that users will know and trust from White Star. The white pail and white lid match the brilliance of the content; the container utilises a metal handle and allows plenty of space for the high-quality design offset printed at Oakham for maximum on-shelf impact. FST is the result of exhaustive investigation into the use of certain microfibres in combination with high-quality, super-smooth, spherical fillers within adhesives. The R&D team at BAL found that a particular integration of specific raw materials would greatly enhance the product performance of even the best powder and ready-mixed tile adhesives. Alex Underwood, BAL Brand Manager, commented: “Our market-leading R&D team continually drive for improved performance and innovative solutions, always aiming to improve the performance of even the most-loved products, through such innovations as FST.